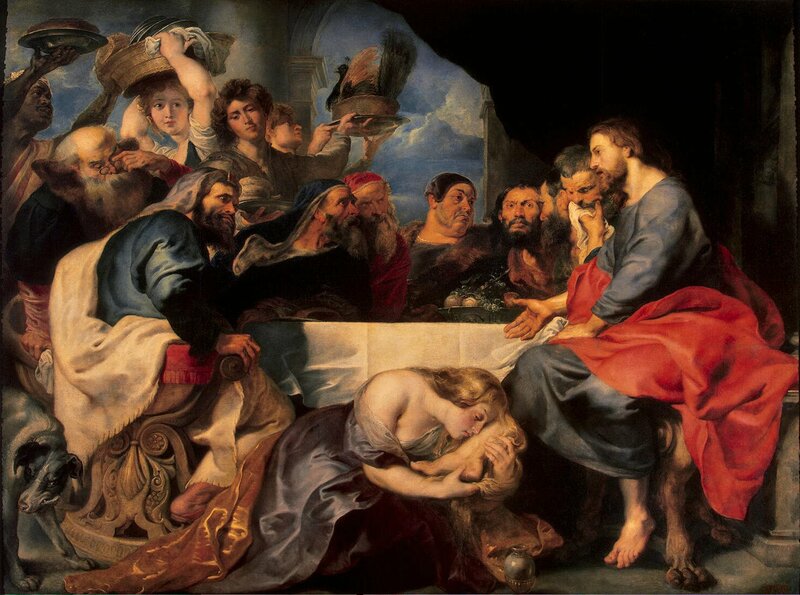 This Sunday’s Gospel speaks of the invitation that a Pharisee made to Jesus to come for lunch at his house, where a sinner woman arrives uninvited and “dares” to wash his feet with tears and perfume. To understand the episode we must remember certain customs of the “good society” of the time. When a wealthy person welcomed a guest at his table, first he called a servant to wash his feet dusty from the road. Then he kissed him, and poured on his head a few drops of scented oil. It is also useful to know that the banquet was public: anyone could come to observe it. Let us identify with one of curious men who enter that day in the house of Simon the Pharisee, who had invited the now famous Jesus. Perhaps, like Simon the Pharisee, we are motivated not by admiration towards the Messiah, but by a desire to “study” closely the man widely regarded as a prophet, a messenger from God. At the banquet, unexpectedly, in the room enters a woman (these types of lunches were at that time only for men) that moreover, was known as “sinful “(so the evangelist Luke calls her). This woman threw herself at the feet of Christ shedding tears and perfume. Jesus allowed her to do so; then he turned to the landlord whose thought he had guessed (“If this man were a prophet, he would know what kind of woman is this and would not allow her to touch him”), saying: “Two people were in debt to a certain creditor; one owed five hundred day’s wages and the other owed fifty. Since they were unable to repay the debt, he forgave it for both. Which of them will love him more?” The Pharisee answered correctly: “The one, I suppose, whose larger debt was forgiven.”” (Lk 7: 40-43). Simon was able to give the right answer to Christ, but ultimately was attracted to Christ only by curiosity. The sinner, unnamed because she represents all of us, was attracted by the look of mercy and the words that flowed from the heart of Jesus and that illuminated her mind and warmed the heart. The Savior gave her the Peace, Goodness and Joy she was looking for, and she wept first for the pain of her sins and then for the joy of forgiveness. The tears of this woman were like the water of baptism, in which the sinner died and the new creature was born. She showed her pain to Christ and He confirmed her in his love. Love is born from forgiveness and forgiveness makes love grow. The encounter with Christ positively shocked the life of the sinful woman and the same can happen to us if we will present our pain to Jesus. I believe that, if we want to be shocked by the forgiveness of Christ, we must first let us be disconcerted by this episode, on which we are reflecting. We have heard it so many times and everything seems obvious and normal. In fact the way in which this woman manifests her pain and her love is staggering. If just the fact to undo her hair in front of men would be indecent to the point of deserving the act of divorce, according to some rabbinical texts, we easily can understand how disconcerting must have been for those men the fact that Jesus let a woman, who moreover was a known as a sinner, wash his feet. He calmly accepted these gestures in front of an embarrassed and scandalized audience. What the Pharisee and the other invitees considered a gesture of legal impurity similar to that of touching a pig or a dead body, for Jesus meant instead hospitality and communion with the sinful humanity: salvation granted as a gift of grace. Of course this inexhaustible gift demands a response, but the answer, in fact, comes later. It is not the first word, it is only the second. Salvation comes from the love that Jesus has for us and that causes him to give his life for us. Salvation cannot come from a duty, because if anything, duties are the expression and the answer to the fact that we had an encounter, a relationship was established between us and Jesus, and that from that time on our behavior has changed. Jesus’ words to Simon, his Pharisee host who actually has never really accepted him even if He had gone into his house, it is just a reminder of the primacy of the relationship. What goes through that relationship created by love? Jesus says it clearly: forgiveness. Forgiveness allows you to have a relationship of communion with Christ. Indeed, what good does to pray Jesus (the Greek word which is translated as “to invite” literally means to pray) to share our table, if the heart is as far away as it was the heart of Simon? This Pharisee stops in the doorway of a true relationship of communion and remains imprisoned in the claim of the pretention of justice of a man who considers himself a good person. He believes himself without sin, so no tear furrows his face. He judges, relying on his knowledge of the Scriptures, guided only by his own criteria, those based on rules and “commandments of men” that have the pretention of correcting those of God. Simon has the gift of sitting at the table with him, but it is a formal presence with an attitude of superiority and sufficiency that makes him forget the elementary rules of welcoming. He believes to fulfill the Law and the precepts, but leaves out the essential which is the acceptance of a guest, with the rites that any Jew used to perform. He did not have even this simple attention, even the slightest care. Very different and truer is the attitude of the ” sinner of the city”, that although she knew that she could not get close to Jesus, ” therefore got near not to the head, but to the feet of the Lord; she, who had long followed the path of vice, was trying to follow in the footsteps marked by the holy feet of the Lord. She began to shed tears, which are like the blood of the heart, then washed the feet of the Lord with the humble confession of her sins “(St. Augustine). And from the depths of sorrow and repentance, “faith” – that is the path that had led her to that piece of land at the feet of Jesus as to the baptismal font, with the hope that the impossible could become a new life- drives her to kneel before him. Jesus knows “whom and what kind of woman is the one who is touching him”: she is “a sinner”, as well as Simon, but, unlike him, she “touches” for love: she “touches” him to hand him her sin. She knows it, knows her absolute unworthiness. Her sins are there, obvious in her hands. It is a sharp pain the one that strikes her chest, a deadly anguish. This woman had touched death, now she touches Life. 4) Hospitality of the heart. The true hospitality was not the one offered by Simon to Jesus but the one given by the sinner and, therefore, by all of us. It was and is the hospitality of the heart. It was born from love. It is not an external behavioral fact, but a fact done by inner choices, dictated by love. Simon’s words opened only formally and externally the door of his house to the Savior, while the tears of the sinful woman opened the door of the heart. Once more it is Jesus who takes the initiative, because the love of those who are forgiven comes afterward. It is the grateful response, the result of that forgiveness offered in anticipatory manner. Jesus forgives us, and when we realize it we learn to love him, through our tears of repentance. “He to whom little is forgiven, loves little,” says Jesus, pointing to the order with which it proceeds: first the pardon, and then the response of love. Reminding us of what we have been forgiven, helps us to love Jesus very much, and to follow him with the tears of repentance and the joy of heart. 5) A teaching for and from the Virgins Consecrated in the world. The public life of this sinful woman changed because she knelt at Jesus’ feet, experimenting the forgiveness and the “peace” in which “to walk” in the new life. This path of liberation must not only be followed to go from bad to good, but to persevere all the way to the feet of Christ on the Cross and in the garden where the tomb was located and where the first among the believers, the Magdalene (nothing prevents us from thinking that the unknown sinful woman is Mary Magdalene) met the Risen Lord, who called her by name. One important way to do so is the one of the consecrated Virgins in the world. Their chastity allows these women to kiss the feet of Christ piously. The Greek word corresponding to this kissing (katafileo) tells us that this is not the kiss of friendly greeting, nor the kiss of passionate lovers or the one of the father pushed by common blood to his son. The Greek word katafileo (to kiss) denotes sincere or genuine devotion (7, 38.45; 15, 20; At 20, 37). This Greek verb is used in the parable of the merciful father who forgives the lost son. It is a tender kiss of forgiveness. It is a kiss of a love that bears all things, believes all things, hopes all things, and endures all things: a love that does not pass because it is an eternal and divine love. It is the love of God who seeks us, forgives us and fills us with grace and joy. The life of the virgins testifies that by giving themselves totally to God, it is possible to love the neighbor in a sincere and genuine way communicating to him God’s forgiveness with the constant practice of works of mercy. Even today we can pour our tears on Jesus pleading for the charity that can turn our limited love to repentance and forgiveness as a gift that goes beyond the threshold of death and sin. Our tears on the feet of our brother and sister, because Christ is alive in everyone. Virginity makes us free to love with a pure love that seeks not return, and that give us freely and without measure to the other. On the words of the gospel, Lc 7,37-50 “And behold, a woman who was in the city, a sinner,” etc. On the remission of sins, against the donatists. 1). Since I believe that it is the will of God that I should speak to you on the subject whereof we are now reminded by the words of the Lord out of the Holy Scriptures, I will by His assistance deliver to you, Beloved, a Sermon touching the remission of sins. For when the Gospel was being read, ye gave most earnest heed, and the story was reported, and represented before the eyes of your heart. For ye saw, not with the body, but with the mind, the Lord Jesus Christ” sitting at meat in the Pharisee’s house,”1 and when invited by him, not disdaining to go. Ye saw too a “woman” famous in the city, famous indeed in ill fame, “who was a sinner,” without invitation force her way into the feast, where her Physician was at meat, and with an holy shamelessness seek for health. She forced her way then, as it were unseasonably as regarded the feast, but seasonably as regarded her expected blessing; for she well knew under how severe a disease she was labouring, and she knew that He to whom she had come was able to make her whole; she approached then, not to the Head of the Lord, but to His Feet; and she who had walked long in evil, sought now the steps of Uprightness. First she shed tears, the heart’s blood; and washed the Lord’s Feet with the duty of confession. She wiped them with her hair, she kissed, she anointed them: she spake by her silence; she uttered not a word, but she manifested her devotion. 2. So then because she touched the Lord, in watering, kissing, washing, anointing His feet; the Pharisee who had invited the Lord Jesus Christ, seeing He was of that kind of proud menof whom the Prophet Isaiah says, “Who say, Depart far from me, touch me not, for I am clean;” (Is 65,5 Sept.) thought that the Lord did not know the woman. This he was thinking with himself, and saying in his heart, “This man if He were a prophet, would have known what woman this isthat” hath approached His feet. He supposed, that He did not knowher, because He repelled her not, because He did not forbid her to approach Him, because He suffered Himself to be touched by her, sinner as she was. For whence knew he, that He did not know her? But what if He did know, O thou Pharisee, inviter and yet derider of the Lord! Thou dost feed the Lord, yet by whom thou art to be fed thyself, thou dost not understand. Whereby knowest thou, that the Lord did not know what that woman had been, save because she was permitted to approach Him, save because by His sufferance she kissed His Feet, save because she washed, save because she anointed them? For these things a woman unclean ought not to be permitted to do with the Feet that are clean? So then had such a woman approached that Pharisee’s feet, he would have been sure to say what Isaiah says of such; “Depart from me, touch me not, for I am clean.” But she approached the Lord in her uncleanness, that she might return clean: she approached sick, that she might return whole: she approached Him, confessing, that she might return professing Him.